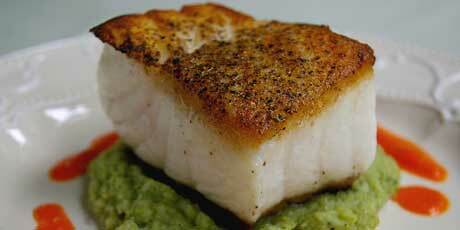 Crisp and buttery bass sits atop a smooth broccoli and leek puree. 1. Heat the oil in a sauté pan. Add the shallot and cook until soft. Deglaze with white wine and cook one minute. Add the stock and the cooked red pepper. Cook 5 minutes. Cool slightly, and purée in the blender. Season with salt, pepper and lemon juice, and transfer to a small saucepan to reheat in a few minutes. 2. Cook the fish: Season the filets with salt and pepper. Heat the butter and oil in a skillet. Fry on both sides until golden and cooked through, about four minutes per side. Serve on a bed of broccoli purée with red pepper sauce alongside. 1. Bring a pot of water to the boil. Cut the florets off the broccoli stem in even sizes. Peel the stem and slice thinly. Slice the leek into rings and rinse well. Salt the boiling water, as for pasta, and add the broccoli and leek. Cook until very tender, about 10 minutes. Drain. Drop in the butter and purée with an immersion blender. Taste and adjust the salt. Add pepper, lemon juice and zest. Serve hot as a bed for fish. 1. Make the sauce. Heat the oven to 400°F/200°C. Set the peppers on a baking sheet and roast until the flesh is soft and the skin puckered, 35 to 45 minutes. Remove from the oven and put in a bowl covered with plastic wrap. Set aside 10 minutes to sweat. Remove the wrap, peel and seed the pepper. Cut the flesh into pieces and set aside.